Froch: Is a comeback on the cards for the boxing hero? Nottingham boxer Carl Froch is celebrating after being awarded an honorary degree from one of the city's universities today. The four time world champion donned the cap and gown at Nottingham Trent University this afternoon. Froch, who's an MBE, received his award alongside other students who were graduating today in front of their families. Froch spoke to us just before he received his scroll. Carl 'The Cobra' Froch has decided to hang up his boxing gloves at the age of 38 - and what a career it has been! Nottingham boxer Carl Froch is vacating his IBF Super Middleweight title. The decision was made due to an elbow injury picked up during training, that ruled him out of a clash with Julio Cesar Chavez Jr. The four-time World champion will now consider his future before potentially defending his WBA Super Middleweight title this summer. It is believed The Cobra may be looking for a summer fight in either Las Vegas or The City Ground in Nottingham. Carl Froch's potential clash with Chavez Jr in the spring has taken a blow after the Cobra picked up an elbow injury in training. Carl Froch has revealed that negotiations over his dream showdown with Julio Cesar Chavez Jr in Las Vegas are nearing completion. WBA and IBF super-middleweight champion Froch, from Nottingham, exclusively revealed to ITV News Central last October that he was near to confirming a Vegas fight with Chavez Jr. He has sought a meeting with the Mexican since stopping George Groves for the first time in November 2013 and is now confident that promoter Eddie Hearn will deliver the fight. "Dare I say it, but we're nearly there with the Chavez fight in Las Vegas which we've long talked about," Froch told Sky Sports News. "After knocking out Groves I was instantly talking about the Chavez fight happening. It's nearly there and I'm very optimistic that Eddie Hearn will be making an announcement very soon." Nottingham boxing champion Carl Froch has told ITV News that he'd consider retiring if a special bout is not in the pipeline. In an exclusive interview with ITV Central reporter Steve Clamp, the four time world champion said that that he is close to confirming a Las Vegas fight with Mexican middleweight Julio Chavez Junior. Froch will be awarded the freedom of his home city at a ceremony tomorrow evening. Carl Froch has told ITV News exclusively that he is near to confirming he will fight in Las Vegas against Mexican boxer Julio Chavez Jnr. I've said before if I can't fight in Vegas I'll probably call it a day, it has to be big, and Chavez Jnr is that man, and I have had a good chat with my promoter this morning and we are making good progress with that fight and hopefully we'll have an announcement soon. "I've said before if I can't fight in Vegas I'll probably call it a day, it has to be big, and Chavez Jnr is that man, and I have had a good chat with my promoter this morning and we are making good progress with that fight and hopefully we'll have an announcement soon." Nottingham's Carl Froch has been awarded Boxer of the Year at the British Boxing Board of Control awards for a record fourth time. Earlier this week, The Cobra, as he is known in the boxing world, was awarded Nottingham's Freeman of the City. 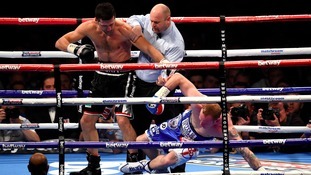 His first fight against George Groves also won fight of the year. Nottingham Boxer Carl Froch has raised £100 for a cause close to home after appearing on ITV's Tipping Point: Lucky Stars gameshow. The Nottingham boxing donated his winnings to Nottingham Hospitals Charity for the major upgrade that is currently underway on the cancer and neuroscience wards at Nottingham Children's Hospital. The whole project will cost around £500,000. The boxer struggled with questions on UKIP and Italian cooking on the quiz show. Carl Froch is supporting Nottingham Children's Hospital when he appears on ITV's Tipping Point: Lucky Stars gameshow tonight.